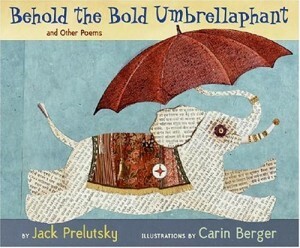 For National Poetry Month in April I did a Jack Prelutsky unit with 3rd grade. We don’t actually have many Prelutsky books in my collection right now, I’ll be ordering those for next year. So because of that, and because April was short due to spring break, we focused on Behold the Bold Umbrellphant, which is a wonderful book of silly poems (illustrated by the wonderful Carin Berger). The kids loved it, and after we’d read all the poems during week 2 of the unit, I broke them into groups and gave each of them an animal. They worked together to come up with their own animal/object hybrids. So I got things like doorilla from gorilla, lionopoly from lion, and umbrellican from pelican. Then I used this resource guide from Harper Collins for our game days last week. The kids did the mazes, alliteration game, rhyming game, etc. Next year I’ll expand the Prelutsky books I use, but this was a great age for this project.